Don't just survive the trek.. Enjoy the Chadar Trek experience with ... Nature Knights!! During the trek; provision for hot meals with plenty of hot liquid beverages like tea/soups etc..
Chadar Trek 2016 (Bookings Open). 9 Days and a Special 5 Days Versions too.. for those who do not have 9 days. Living the Experience.. check out the documentary. Batch - 1 (January 22th, 2016 ) (9 Days Ex. Leh). Batch - 2 (January 30th, 2015) (9 Days Ex. Leh). Check a special video, Memories from last year (Zara Nazar Utake Deho). Day 4 – Gyalpo camp to Shingra Koma to Chilling and drive to Leh. Day 5 - Return from Leh. It is strongly advised that you do not venture out of Hotel on day one.One need to let their body acclimatize to cold and high altitude (thin air conditions). To acclimatize rest and sleep most of the day, drink lots of water. Every thing should be done in slow motion on day one. For those looking to hire Down Jackets; Gloves needed for extreme cold; have to inform us well in advance so that we can make it available for them. Balance amount 2 months before the trek date. YOU MAY ALSO DEPOSIT THE CHEQUE AT ANY OF THE HDFC BANK BRANCHES. Local transport (Point to Point) as per planned program. Tents stay on Twin Sharing Basis with Good Camping Mats and Warm Sleeping Bags. Hot Meals (Breakfast; Lunch, Evening Tea, and Dinner). during the noon break lunch will be mostly noodles or rice item. Hot Tea / Coffee / Soups will be available during most meals. Non Veg will be provided whenever possible. 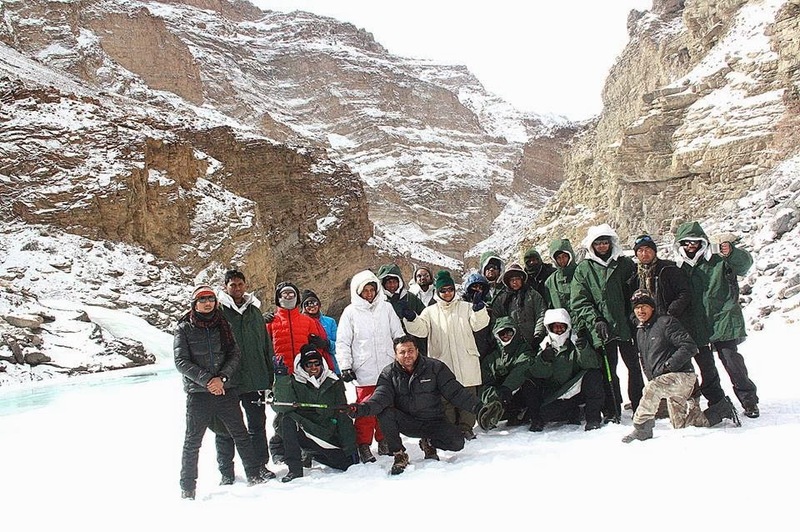 Our team will comprise of Experienced Trekkers; Special Local Trek Guides; Local Porters. Porters for your personal luggage (2 set Change Clothes will be carried by porters, carry dry bags to pack these and hand it porters with name tags.). All you balance luggage will be kept safely back at the hotel. One set of Cramp-ton will be provided to you at the beginning of the trek; the same has to be handed over by you towards end of the trek. Dry pit toilet tent will be available at the campsite. Other resources for the trek: Kitchen tent, Mess Tent, food, toilet tent, mattress, utensils, crampon, trek leader, local guide, cook, helper and, porters for the group equipment. Our porter carry the central equipment like sleeping bags (Each sleeping bags will also be tagged in name of each person the day one of the trek), cooking utensils, camping gear etc. Travel or accident insurance is not included. Flights to Leh is not included in the cost. Cost of any rooms Service or any other food not part of the package has to be borne by the customer. Porter cost to carry personal luggage Rs.250/- per day. If you need personal porter to carry your backpack so you have to pay extra per day per bag. Trek will be lead by our trek leader. If you are not able to complete the trek and would like to turn back; all expenses related to your un-scheduled return will be borne by you and settled in cash before your departure from Leh. No cancellation fee if cancelled before September 15, 2015. (Note the fee can be transferred for another date in 2016 or 2017 batch). Rs.5000/- Cancellation fee if cancelled Between September 16 and October 31, 2015. Rs. 6500/- If Cancelled between November 1st, 2015 and November 30, 2015. 40% of the Camp Fee if cancelled Between December 1st, 2014 and December 15, 2015. 50% of the camp Fee if cancelled between December 16th, 2014 and December 31, 2015. 75% of the camp Fee if cancelled between January 1, 2015 and January 10th, 2016. No refund if cancelled after January 11th, 2016. Extra cost incurred due to change in plans; weather conditions; flight cancellations; act of god; natural or man made disasters / emergencies; or any other reason beyond control of organizer; the cost of the same will be borne by the customer. Camp fee does not include any medical or travel insurance. Layer 4 - Wind Proof / Water Proof Jacket with a wind proof hood. (down jackets or Snow Jackets meant for extreme cold weather). Note: A Good Trekking shoe is mandatory and also carry Gum Boots. Bathing during the trek will be a luxury and too tough for most people to even think about. But its very important to maintain personal hygiene. 3) Wet and Dry Moisturizing Wipes (One may need to warm these tissues every morning before use as they may be in frozen conditions). As the day progresses the temperature is fairly bearable. especially once our body gets warmed up after trek. Biggest Challenges here are stay is in tents and extreme cold conditions (as most of the trek is over frozen river or snow). Mental toughness and attitude is what one may require to face the cold conditions more than physical preparedness. Back pack (50 ltr -70ltr)- with comfortable shoulder straps, frame, and back pack cover (line the bag with polythene). 1 Fleece T-shirt and; 1 Fleece jacket; a woolen sweater would be an alternative. 1 Wind proof down jacket. 1 Heavy/ Down/Feather jacket with hood. 4 pairs cotton shocks and 3 pairs woolen socks. 2 pair water proof snow gloves and 2 Pair woolen Gloves. 1 Liter water bottle. (Grade One Plastic Bottle). Sun protection cream and; Lip Balm / cold cream. Quick dry Towel- It should be light / thin. Dry Bags (Minimum 1) with locking facility. 1 Duffle bag, this will be left behind at the hotel with all your belongings that you do not intent to carry for the trek. You have only one option to reach Leh during winter, i.e. fly to and fro all other route are blocked due to extreme winter. Expensive labour, Porter rates are more than double in winter. You can imagine why. Rentals of all equipment and gear are very high during this season. All food has to be flown in so obviously is very expensive. Fuel since it is very limited is very expensive, it takes almost twice the amount of fuel to cook the food than in normal conditions. It is not advisable to have a very large group of trekkers on a single party.